(CNN) -- The sights and sounds of rocks rolling down mountainsides are common but still captivating phenomena for the residents of the Nile Valley in central Washington state. 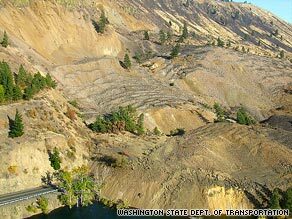 The landslide covered up to a half-mile of Washington state Route 410 with rock up to 30 feet deep. "Every morning I hear big rocks coming down," said longtime valley resident Frank Koch. But a landslide over the weekend was more than Koch and the other 1,500 people in the Nile Valley bargained for. "We just had the whole face of the mountain just pretty much come off," said Valerie Royster, manager of the Woodshed Restaurant, which sits just across the road from the edge of the landslide. The slide covered a quarter-mile to half-mile of State Route 410, which connects Yakima with Mount Rainier National Park, with rock up to 30 feet deep, said Washington state Department of Transportation spokesman Mike Westbay. The mountain's movement attracted dozens of residents to the parking lot of the Woodshed, which Royster calls the hub of the community, on Sunday morning to take in the spectacle. "It was a slow slide," she told CNN by telephone Monday morning, which meant residents had enough warning to get out of their homes and to the Woodshed's parking lot to watch nature's majesty and fury. "It was very loud. You could watch trees coming down" as the slide pushed the rocks in the valley's riverbed 30 to 40 feet up the opposite bank, Royster said. Afterward, residents found river fish high and dry on the hillside, she said. Westbay said the slide was like nothing the state has seen before, in that it wasn't the result of a weather or seismic event. "We've had rockslides, mudslides, avalanches, but nothing like this," he said. Geologists were calling it a "natural land movement," he said. Westbay said the rocks had stabilized by Tuesday morning, and crews had begun work on a temporary gravel road to restore access to residents. Flooding was the biggest obstacle to that; the slide changed the course of the Naches River, he said. For all the spectacle of the weekend, local resident Koch was impressed by something else Tuesday morning -- the government response. "They're out there kicking bootie today," he said of the repair crews. "It's pretty amazing to see government moving that fast."